This past weekend, my little family and I spent a couple of days on Lopez Island. It’s a place I have mentioned here more than once (most notably here) and that is simply because it has been – and is – a big part of my life. Now that I have a better camera, I was able to take some photos to share. They tell a much better story of how special the place is than I ever could – even if I was the most eloquent writer around. The top photo was taken from my parents property. 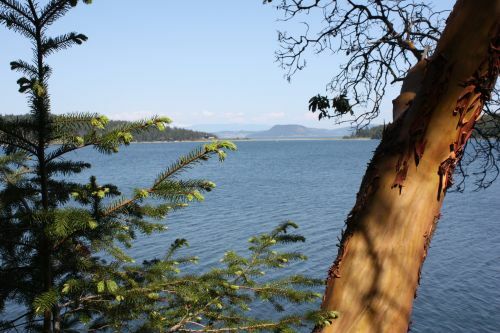 I love this view because it has a Madrona tree which are native to this area and don’t really grow much outside the Pacific Northwest. I think their red bark and gnarled branches are striking. We are looking out at Mud Bay and at the former location of Camp Nor’wester. 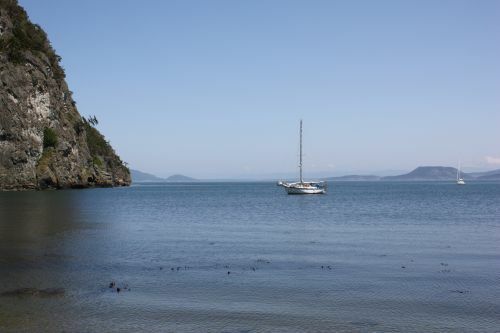 Camp has relocated to an island called Johns and that incredible 350+ acre piece of property now belongs to Paul Allen. He uses it about one night a year. It used to house teepees and an authentic NW Coast native long house and now it houses 5 gigantic structures that sit empty 364 days a year. But I’m not bitter. This is where Randy and I got married. The most lovely, small, and scenic church I have ever been to. In true Lopez fashion, it is shared by the Catholics and the Lutherans. 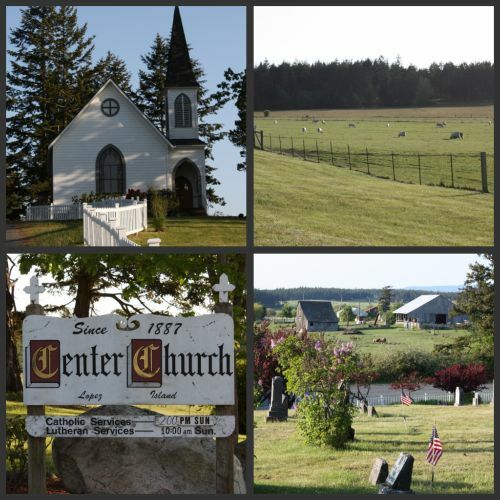 From the church you can see these fields and barns, plus the cemetery which has some graves from the late 1800′s. 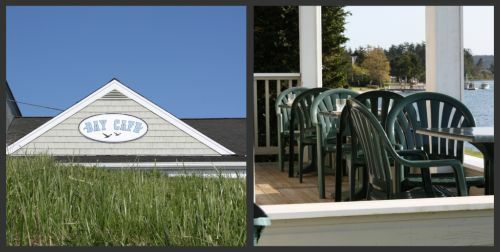 This is where we had our wedding reception, The Bay Cafe. It is my most favorite restaurant in the world. Last year when we ate there, we were a little disappointed in the food but I am happy to report that it is as good as ever. This was my main course. 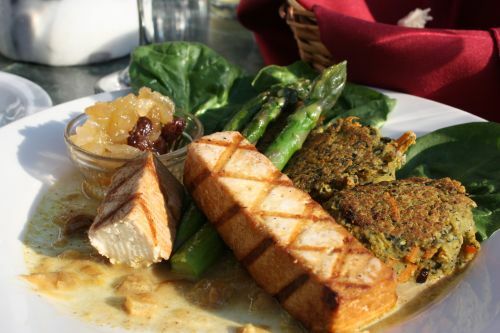 Grilled tofu with chick pea and black bean cakes all on a bed of curry and served with chutney, asparagus, and spinach. All restaurants in Seattle could learn something from this dish. This is what vegetarians want to eat! This is the most incredible beach I have ever been to. It’s called Watmough and it is kind of difficult to find. Once you park, you walk down a long and heavily shaded path. Even in the dead of summer, there are puddles and slugs along the way. Because there are so many trees, you have no idea what awaits you at the end. A perfect bay, a view of 10,777 foot Mt. 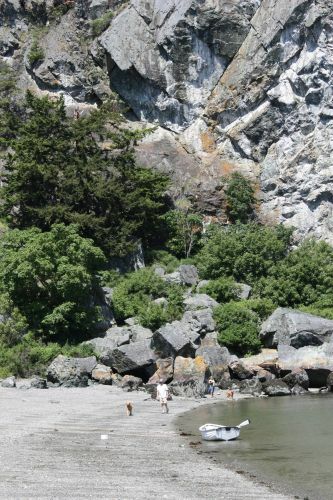 Baker (I know it’s that big because I climbed it), and these cliffs. My dad calls them, affectionately, the cliffs of insanity. (Name that movie.) They go on up at least twice as high and perhaps three times as high as you can see in this photo. I have seen many things on this beach. I have seen people skinny dipping. I have seen my brothers kayak in from our house. I have seen tarps strewn across the driftwood with freezing cold and soaking wet kids from Camp Nor’wester huddling underneath. And I have seen a ruby ring in a bronze box when Randy asked me to marry him. Here on this beach. I think your writing skills absolutely do this gorgeous place justice. How lucky you are to have a special island in your life (I know, I’ve got one too). Thanks for sharing it with us! Your post made my desire to visit Lopez even stronger. Lopez is so beautiful and you’ve captured the feeling wonderfully. I’d love to go back again & try out the Bay Cafe. Thanks for this slice of life, I loved reading it. What a lovely place for those memories! Just beautiful. That’s a delicious looking vegetarian meal too. Princess Bride! The island looks gorgeous, I can see why you love it. I was on Lopez (my “happy place”) last weekend as well and it has come alive! The weather was glorious for everyone fortunate enough to be there. I missed the Bay Cafe last weeknd, but enjoyed a wonderful Mother’s Day dinner there just a few weeks ago. Your blogs are great! What a picturesque peek into your world! It must be hard to pack up and leave a place like that, but what wonderful memories you have made there. Just beautiful~ What a romantic and dreamy island get away. Thanks for sharing. Dana, thank you so much for this post. I loved getting a glimpse into this beautiful place and all your special memories from there. And that is just the sweetest church ever.